Pro gamers may now travel to the United States on the same visas given to professional athletes, thanks to a long lobbying effort by Riot Games, the makers of the eSports staple League of Legends. 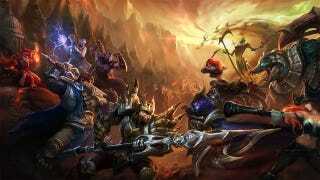 Riot told GameSpot about the effort in a video interview published yesterday. "It was a lengthy process," said Nick Allen, the eSports manager for Riot. "We had a lot of people fighting for this." Allen called the decision "groundbreaking for eSports; now we can start looking at international players when they come over. It's a much easier process because they're actually recognized by the government. This is a huge thing." In the video, Allen goes into further detail about Riot going back and forth with the government, ultimately providing evidence that pro gaming was a sport. So there it is: professional gaming is a sport, according to the U.S. government, the same way the U.S. Supreme Court said video games are works of art. Next time someone scoffs at you, you may trot this out and watch someone stammer and twitch.